Auriculotherapy is the stimulation of specific points on the ear, which is believed to be a microsystem of the entire body where the whole body is reflected in the ear. It is also called Ear Acupuncture. Our Licensed Acupuncturists utilize it during their treatments in our offices. These Ear Acupuncture points can also be used for Ear Acupressure, by placing Ear Seeds or Pellets, which do not pierce the skin. There are over 200 points in the ear, they can help physical and emotional conditions. The World Health Organization stated that the ear is perhaps the most studied microsystem of the entire body. Some texts show it has been studied as far back as 4000 years! This is an informational 2 minute video from earseeds.com, the supplier of our Auriculotherapy products. Ear Seeds are tiny seeds from the vaccaria plant that are held in place on the ear with a piece of adhesive, skin colored tape, which contains latex. These are the seeds contained in our Condition-Specific Kits. Ear Pellets are are tiny stainless steel metal pellets with clear, latex free adhesive tape. with clear latex free adhesive tape. They have Swarovski Crystals on the outside, which are for aesthetic purposes. 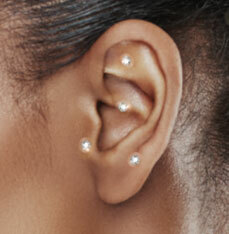 We like to call them Bling – Bling Ear Seeds! 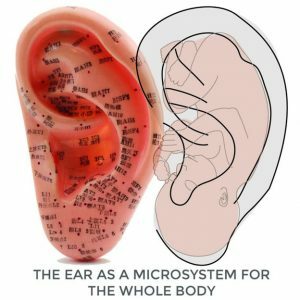 How does it work and what is an Auriculo Consult? 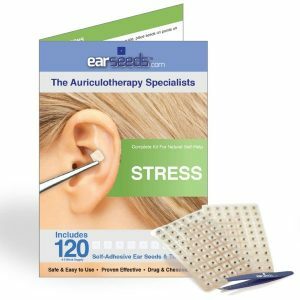 During an Auriculo Consult our Licensed Acupuncturists apply the Ear Seeds or Pellets to condition specific Ear Acupressure points on the ears. They also teach our clients how to apply their own Ear Seeds for conditions which apply to them. 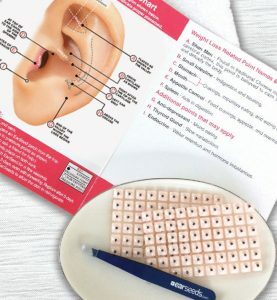 We use a human sized silicone ear model for teaching purposes as well as an Ear Acupuncture point detector during our Auriculo Consults. Additionally we take pictures with our client’s camera of their ears after the seeds are placed. The seeds cause a continuous slight pressure which activates the Ear Acupressure points. Additionally they can be gently squeezed between two fingers to increase their effect. This can be done multiple times per day. One Auriculo Consult is $27.50. It is also part of our Happy Hour Acupuncture Package: Buy 4 get 1 FREE for $110. Each new condition specific Ear Seed placement requires an Auriculo Consult. 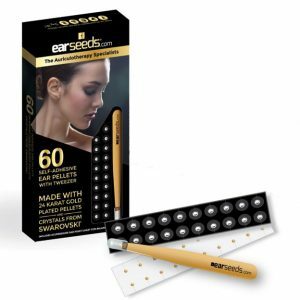 After the initial Auriculo Consult, clients may purchase our condition specific Ear Seed Kits. 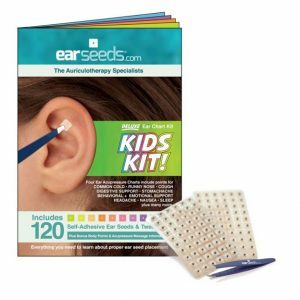 All condition-specific kits contain 120 Self Adhesive Vaccaria Ear Seeds, Tweezers and a Condition-Specific Ear Chart. We have the following kits available, each for $18. Additionally we sell Swarovski Crystal Seeds (Bling – Bling Ear Seeds) as well as Stainless Steel Pellets with clear tape. See our complete Auriclo Therapy Price list here. Call us at 541-387-4325 or 541-298-2378 to set up your Auriculo Consult!